Eye-tracking equipment has been used for a multitude of studies including Internet Consumer gazing behaviours, eye-movements during word-reasoning tasks and a study I conducted for my undergrad psychology degree– gazing behaviour of social and unsocial individuals. My hypothesis was that highly social individuals would make increased eye-contact with the images of faces. Further hypothesised was that highly social individuals would show higher rates of gazing behaviour for images previously rated as social (in a pretest – it was a rather lengthy process to perfect the experiment!). Some shameless self promotion, the paper I have written will be published in the coming months, I thought I would write a piece on what eye-tracking equipment can and cannot do. The following image shows a scan path that the equipment recorded for my experiment. Larger circles show increased time (ms) on that area and you will notice that circles are numbered 1, 2, 3 etc… This shows the gazing path, 1 being the first area that the equipment recorded the eye hitting. 2, 3 etc are the where the eye had moved. The following image shows the attention map for the gazing behaviour for another participant. 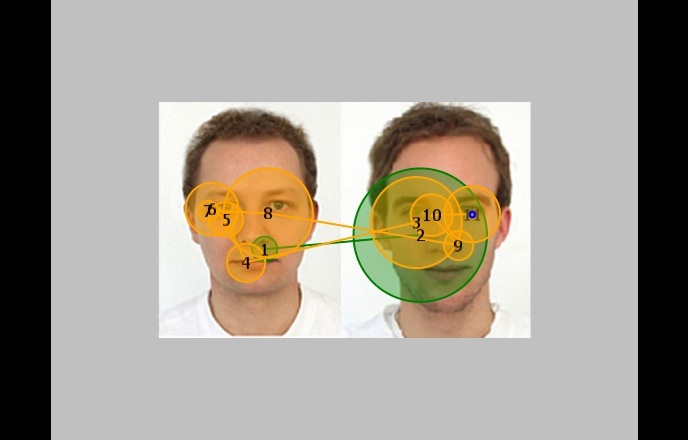 The attention map shows the areas of the image that the eyes of the participant looked at. 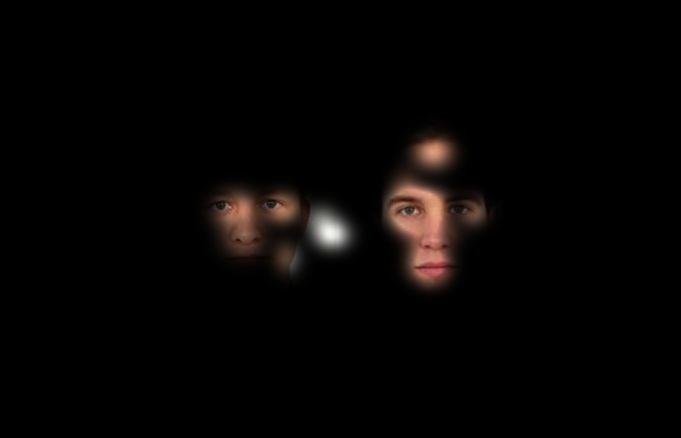 While the participant perceived the whole image for sure, the areas shown display the parts of the image that the participant had increased gaze. The eye tracking equipment was a desk mounted monitor and the images shown were displayed in a slideshow format – each image was shown for 7 seconds (7000 milliseconds) and there were 10 images. It froze a number of times. I was working off of a safe computer with no internet connection that didn’t allow USB sticks (in case of infection – the equipment is over 10000 euro). In spite of this it was glitch and I had to disregard 2 participants’ data as it didn’t record efficiently. I think that if the computer was a mac, things may have been a little easier, but maybe not. The amount of data that is recorded is staggering. It took me 3 months of sifting through and adding up data, a lot of which I didn’t use. In the end I did some of the totals by hand out of convenience. I wouldn’t advise it on anybody unless they have more than 6 months to do the study.